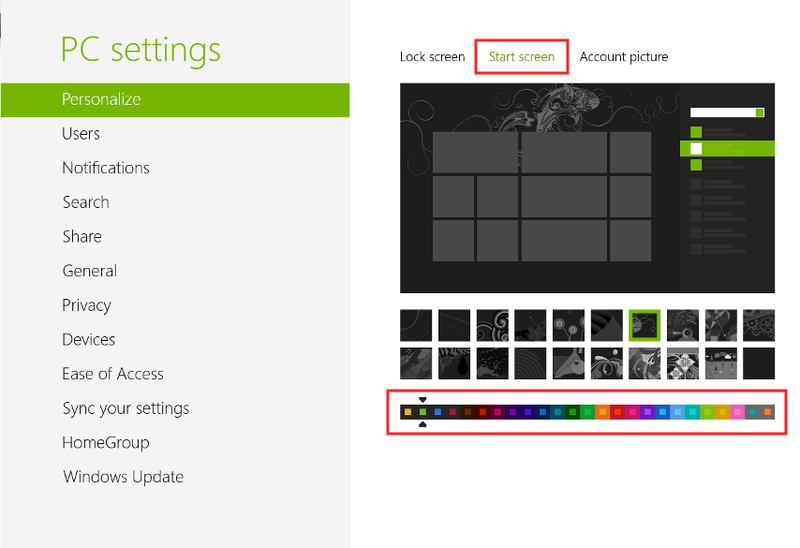 This document explains how to change the background image for your lock screen(s) and the background color of your login screen(s) in Windows 8. 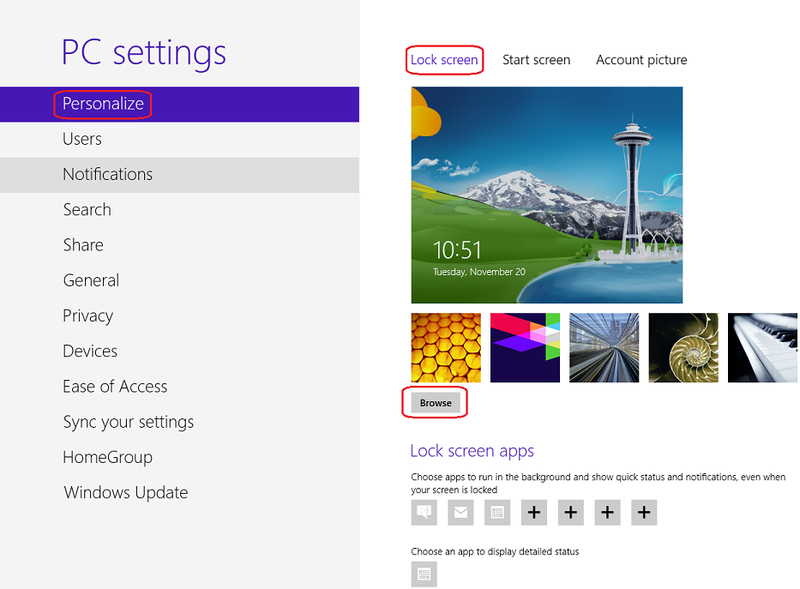 First, it is important to understand the difference between the various lock and login screens in Windows 8. Some of these screens are controlled by individual user accounts, while others are system-wide defaults. Knowing which screen you need to change can be quite confusing, owed in part to the variety of terms used to refer to them as well as the subtle differences between the two "versions" of these two screens. When a user is logged in but has locked their account, they will see a lock screen image. By default, this is an illustrated image of the Seattle Space Needle. For the purposes of this document, this screen will be referred to as the User Lock Screen. If the same user were to log back into their account, they will be brought to a login screen with a solid color background that displays their account picture. We will refer to this screen as the User Login Screen. The color shown on this screen is the same color used for your Start Screen background. Move your cursor to the upper right corner of your computer screen to reveal the Charms Menu. In the Charms Menu, left-click or tap the Settings icon. Note: You can also go directly to the Settings menu from any screen by using the key combination Windows + I. At the bottom of the Settings menu, left-click or tap Change PC settings to open your PC settings options in the Windows 8 User Interface. Select Personalize on the left. Select the Lock Screen tab on the top right, and select Browse to choose your lock screen. Note: These instructions describe how to change the login screen color. There is currently no way to set a background image for this screen. Select Personalize on the left, then click the Start Screen tab on the top right. You can then use the color selector bar to choose a new background (outer color) and accent color (inner color) for your machine. Only the background color applies to your login screen. Note: This color combination is used in multiple places on your PC. In addition to the login and Start screen, these colors affect various menus and buttons, so be sure to pick a combination you like. When the last user is logged out of the computer, a lock screen image will display that is not tied to any individual user account. We will call this the System Lock Screen. Because the default image on new machines is also the Seattle Space Needle, this screen may initially seem indistinguishable from the user lock screen. Unfortunately, there is not a built-in tool within the Windows 8 interface that allows you to change this image; however, it is possible to do within Group Policy Editor for Windows 8 Pro, Enterprise, and Server users. There is also a way to change this for Windows 8 Home Edition, though it is significantly more complicated. Pulling up the login screen from the system lock screen will display the various user accounts you can choose from to login. This screen will be referred to as the System Login Screen. The background color on this screen is set independently of any one user account. Just as with the system lock screen, the only way this color can be changed is by editing an advanced setting. CAUTION: This document includes instructions for modifying the registry on your computer. 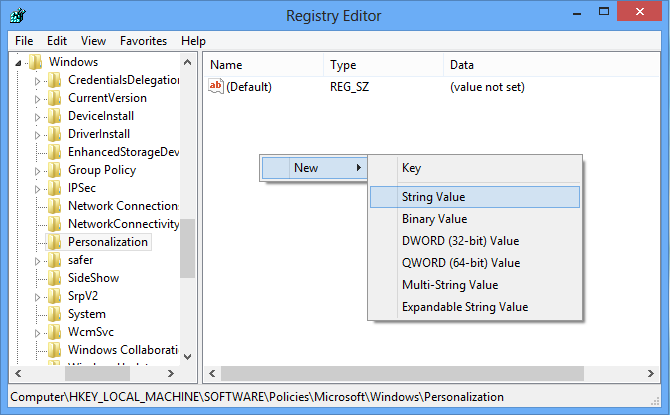 Modifying the registry improperly can result in Windows becoming corrupted. You should only attempt these directions if you have your data backed up and are willing to risk creating additional problems. You should also back up the Windows registry (see Windows - Backing up the Registry) before attempting any changes. The DoIT Help Desk is not liable if you choose to attempt the fix described below. Before you begin: Please ensure the image you are planning to use is saved as a JPEG (.jpg) file and has the proper dimensions and resolution for your computer screen. From the Start Screen, type regedit and press enter. If prompted by User Account Control, click Yes. 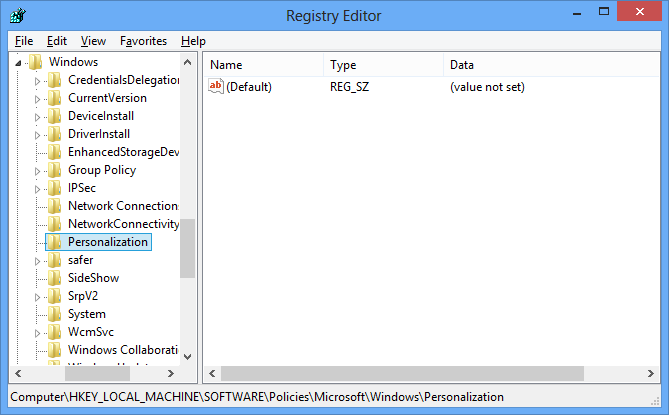 In the Registry Editor, navigate to HKEY_LOCAL_MACHINE\SOFTWARE\Policies\Microsoft\Windows\Personalization. Note: If the Personalization key does not exist yet, right-click Windows and select New > Key, then name the new key Personalization. In the right-hand pane for Personalization, check to see if you have a value called LockScreenImage. If one exists already, skip to step 6. Otherwise, proceed to the next step. Right-click anywhere in the blank space within Personalization and select New > String Value. The value name should be LockScreenImage and the value data should be the path to the image you would like to use as your lock screen. To edit an existing LockScreenImage string, right-click the string and select Modify.... In the Value data field, edit the path to reflect the location and name of the new lock screen image. Click OK. When you are done, close the Windows Registry Editor. The change will take effect immediately; you do not need to reboot the computer. From the Start Screen, type run and press Enter. Type regedit in the open text box and click OK. If prompted by User Account Control, click Yes. 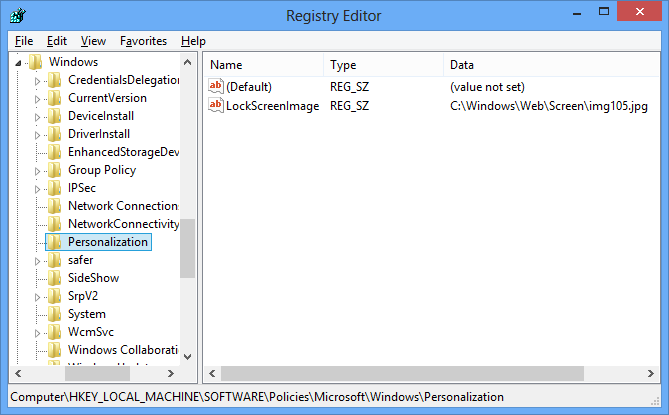 In the Registry Editor, navigate to HKEY_LOCAL_MACHINE\SOFTWARE\Microsoft\Windows\CurrentVersion\Explorer\Accent. Within Accent, check to see if you have a DWORD value titled DefaultColorSet. If this value already exists, proceed to the next step. If this value does not exist, right-click somewhere in the empty space within the right-hand pane for Accent, and click New > DWORD (32-bit) Value. Type DefaultColorSet and press Enter. In the right-hand pane for Accent, double-click on DefaultColorSet to edit the value.